I’m going to use the first sentence of this review to complain about the title of this book. Funeral Hotdish sounds like an entry into a cozy mystery series – and it is not. It’s actually a very good title for the book once you understand why the author chose it, but don’t be either drawn to it or scared away from it based on the hokey name – this is not a cozy mystery. Now that I have that off my chest, we can talk about what the book is, rather than what it is not. Funeral Hotdish is the story of a small town in North Dakota that experiences a horrible tragedy on October 15th, 1999, one that shocks them out of their complacency as part of an ever more dangerous world. It’s also the story of reporter Joya Bonner, who lives in Phoenix and has lucked into the biggest story of her life. She spots a mafia figure, one that disappeared into witness protection, in a local restaurant, right around the same time as her hometown in North Dakota is suffering its tragedy. Through that piece of luck and some close ties with the police force, she is getting an exclusive other reporters would kill for. The book hops back and forth between the two stories with Joya as the ostensible middleman who is concerned about her parents and other extended family living in a town that seems ready to explode as blame is laid and tensions rise after the misfortune of that late October night. Unfortunately, only one of these stories is even remotely interesting, and that’s the one in North Dakota. Joya is useless as a character, her mafia story is boring, her life in Phoenix is barely sketched in and as a conduit between the two worlds she’s flimsy and annoying. Her grasping to connect the incident that divides her home town and the mobster she wants to use to make her name in what passes for investigative journalism is laughable in its transparency and ineffectiveness. This isn’t intertwining stories, it’s two different books. But the story in North Dakota – that one really is interesting. 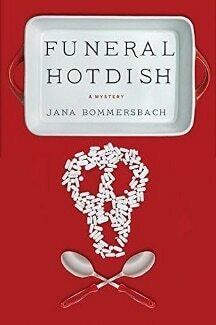 Author Bommersbach should have left out the semi-autobiographical story of the Arizona mobster and focused on her characters in the Midwest. That’s where her characters shine and her ability to create a town filled with history and pride and sense of itself as a living entity really comes through and pays off. Joya’s parents, along with other town elders, are stubborn and compassionate, depending on whether or not you agree with them. The town rallies around those who hurt and grieve and simmer with rage at those who they perceive did the damage. It’s a good, well-paced, tight story – that’s unfortunately broken into a bunch of small pieces by the regurgitation of the author’s already published story of her mobster coup. In the end, I wish I could split Funeral Hotdish in two and recommend half. But since I can’t, I can’t recommend it at all. The two parts are simply too disconnected and the inclusion of one is the downfall of the other. That makes me sad. So two stars for the North Dakota story and characters, 0 stars for the Phoenix story and no recommendation for the book as a whole.